That is why I want to dedicate this recipe to Forbes Farm, an independent family-run organic farm in Oliver, B.C. that I discovered recently at the Penticton Farmers' Market this summer while cooking in nearby Naramata. Forbes Farm’s melons are some of the best I have ever tasted. A perfectly ripe cantaloupe is a thing of beauty. Musky and juicy, it falls heavily and easily from the vine as it is being picked. At the farmers' market, choose melons that are noticeably sweet and fragrant and feel heavy for their size. The Charentais varietal is my personal favourite. Developed in France around 1920, it is generally more fragrant than the common cantaloupe I ate while growing up in North America. Although I have often seen melon paired with prosciutto, I prefer to use speck, a smoked and aged ham that is cured with spices that lend it a deeper, more intense flavour than its Italian counterpart. Whisk all ingredients together. Store in the fridge until ready to use. Can be made up to three days in advance. Cut the ends off the cantaloupe. Using a knife, remove the skin from the melon. Cut the melon in half, lengthwise. Spoon out the seeds and discard. Cut each half into 4 slices. Cut each slice into 4 to 5 pieces of equal size. Cut each nectarine into 8 pieces. Mix the nectarines and the melon with enough citrus vinaigrette to coat well. Plate on a large platter. 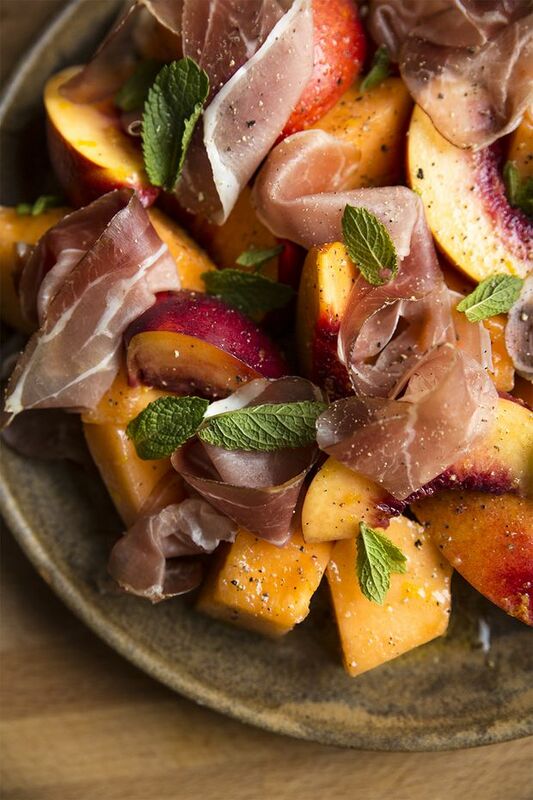 Drape the dressed fruit with the ham and garnish with mint leaves. Finish with more freshly cracked black pepper. Spoon more dressing on top if required. Serve immediately.